Let me reveal what I’ve discovered! Over the past 30 or so years I’ve seen a number of Home Based, Sales, and Retail Businesses. I began my own foray into the business world before I was 14 years old! I think my involvement with Sales and Business may have spurred forth from my time spent helping our new local Volunteer Fire Hall sell tickets to raise funds for our new Fire Hall! Any way, at 14 years old I’d been tying and selling flys for a couple of years and I was having trouble keeping up with demand! I could can only make so many flys at a time or per hour and so I was limited by my own time elements! Unfortunately we only have 24 hours in a day! So, when my sister and her husband looked at Amway I saw that according to their plan it would be possible to duplicate one’s self through recruiting other people and helping them become successful. I thought this was a great thing! I considered getting other people tying fishing flys and how if i became the supplier I could duplicate my efforts. However that was sort of short lived as it was easier for others to make their own and sell them than it was for them to get them from me! So, now cheap I knew the concept, I’d seen the plan, and to be honest, as a typical teenager I had a short attention span and was to young to join Amway at that time and so I stored it in the back of my head and went on with the rest of my life! Later I would come back to join Amway, two or three times, I even recruited a few people! I went out drawing circles every night, ran the roads like a mad man, and I think the biggest amount of residual money I kept for myself in any given month was about $16! Then, you know after two or three times, I finally left Amway for the final time and though I’d not made any money! I had learned some great sales and life skills! The other business that I really thought would work was Melaleuca! Like Amway many of their products were great! Yet, once again even after recruiting my friends, family, and others, I still made no money! Nor did my recruits! So, by this time I had nearly given up! My dreams had nearly died, the hype was gone and so was everything else! Then one evening about 6 years ago I happened to watch a movie about Bill Porter an American salesman for the Watkins Company. Born with cerebral palsy, Porter became quite well known in 1995, when an Oregon newspaper wrote a series of feature stories about him. He was unable to gain employment due to his cerebral palsy, but refused to go on disability. He became a Watkins Associate and went door-to-door as a salesman, selling its products on a ten-mile route in the Portland area. He eventually became the top seller for the company! It is truly an inspirational story! At least inspired me to go online and sign up with Watkins. I signed up and sold products at the local Market at the Zellers Mall in Yarmouth Nova Scotia for about a year till the Market closed. When the Market closed I let my Watkins Membership expire and I sort of put it out of my mind for awhile! Perhaps I should have kept going, but though the people I had signed up with we’re friendly, I think they lacked training and they too were focusing on recruiting more than selling! Then 5 years later, last Sept., a neighbour came in the yard to buy some of our vegetables and mentioned that His Mother-In-Law has gluten issue and can’t buy things like pepper in the store as it has flour and other fillers in it that sometimes make people sick! Normally if we don’t have allergies to these ingredients we never really know they are there! However, for people who have allergies or food sensitivities their Doctors tell them about the fillers so thay can better avoid them! My advice to my neighbour was to go see Angela or Dawn at the Annapolis Market. Then when my neighbour drove out of the yard I sort of had a long talk with myself! Here was my neighbour and vegetable customer and I was sending Him to someone else for His Watkins Products! So, what’s the difference? What’s the Secret!? Well, as you can see I referred to those I enrolled in Amway and Melaleuca as Recruits! That’s because they are the type of businesses that, though they have good products and good intentions, focus almost entirely on recruiting! There are other differences that make them different as well, Amways’ Dream Session (always trying to get you “Fired Up” and excited) and Melaleuca’s minimum monthly requirement of placing an order every month for about $80 – $100. However, it’s the Recruit, Recruit, Recruit, mentality that turns most people off. The difference with Watkins, at least with our Team at Watkins, is that we focus more on Sales! Imagine a Home Based Business that focuses on making money through sales! Now that’s not to say that we don’t sponsor, we do. However, our focus is on earning through sales and building a Sales Team. So, even if it was as easy to enroll people in Amway and Melaleuca as it is in Watkins the reward is quite different! It is interesting to note that although Melaleuca requires a monthly commitment of about $75 -$100/mo, and Watkins does not, the average monthly order with Watkins Associates is about twice that of Melaleuca! I believe the reason for that is that Melaleuca is mainly self use and Watkins supports it’s Associates in all aspects of legal and ethical sales practices. It’s no wonder that with Watkins we’re making money! When we meet someone with Watkins it’s usually Products first, then discovering if they want to buy at wholesale or retail, or if they themselves, or someone they know, may be looking to earn an income? With this approach, people do not feel threatened, as though they are the object of some strange Head Hunting Game! 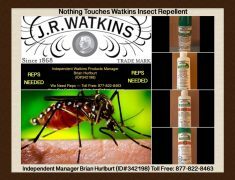 As I often tell people, as great as Watkins and Watkins Products are, the best part about being a Watkins Associate is my customers; and having them run toward me instead of away from me!!! No wonder Watkins has maintained such a warm sense of home and security for so many of our customers! We’re not head hunters! the statements or opinions of  Watkins Inc. This entry was posted in Uncategorized and tagged amway, associates, business, Business World, Drawing Circles, earning, Fire Hall, Fisherman, Foray, home based, income opportunity, Industry Secrets, Mad Man, Mail Order, melaleuca, New Fire, Own Time, Peppermints, Pop Corn, Residual Money, Rest Of My Life, Retail Businesses, sales, Short Attention Span, Time Elements, Typical Teenager, Volunteer Fire, watkins. Bookmark the permalink.